When I first moved to East St Kilda/Balaclava in 1998, it had bit of a 'poor man's St Kilda' feel to it, but even then, the eclectic shopping street was very 'real' - loads of greengrocers, fishmongers, butchers, bakers, gift shops, and just one supermarket. Nothing very hip, though hugely liveable. In the years since then, Carlisle Street has become not just hip, but hot! Real Estate agents are now calling it 'Balaclava Village', much to the amusement of locals. However, unlike Acland Street, while the cafes have arrived, so far (fingers crossed), the shopping strip has managed to retain it's neighbourhood shopping and local stores. We may now have 2 supermarkets and one or two less greengrocers, but we have more quirky boutiques and small bakeries like artisan 'Catcher In the Rye' Bakery, and a mouth watering patisserie. 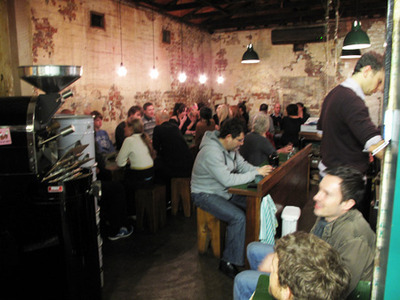 But what has really got the Carlisle St groove going is the arrival, over the last 10 years of a lot of really terrific cafes, who take their coffee and their food seriously. The whole cafe scene in Carlisle Street was really mobilised by The Wall, which has recently expanded - originally built into, yes, a wall next to the local glaziers, with regulars hanging out on the milk crates and stools in the morning sun beneath its eponymous graffitied wall. It's popular for its mouth watering turkish bread toast and simply great coffee - and was named as one of the world's top 10 cafes in a Wallpaper magazine review some years ago. Whether its edge has since been stolen by other local cafes is up for hot debate. Batch, the tiny little cafe snuggled in next to Glick's famous Kosher bagel bakery up near Westbury Street, is considered by locals to have hands down the best coffee around - and to-die-for corn fritters! Batch is a friendly and lively local, though people travel here just for the coffee, and it always has really distinctive flower-art in its windows. Opposite is possibly one of smallest cafes in Melbourne, Midali, made up of not much more than a coffee machine, but which has a solid local following. On the opposite side of the street, right near the ramp up to Balacalva Station, is Las Chicas - there can even be queues waiting to get into this buzzing place on the weekend - a place to be seen for sure, but justified by its mind-bogglingly delicious and inventive breakfasts. A shared cafeteria table spot in the tiny courtyard out the back is highly coveted. Just a bit further along the street you can find Lava and next door is Gattica with its delicious in-house baked cakes & Wood fired pizzas. Both great places for those who like to sit back with their coffee and the Sunday papers. The best pancakes in Carlisle Street are tucked up away from the main crowd at the end of the shops, at Cafe Qua on the corner with Carlisle Avenue. It's worth coming here for the friendly service alone, but the food is scrumptious too! While all the cafes mentioned here have great vegetarian options, vegans are also well catered for, with the buddhist sanctuary style Monk Bodhi Dharma, tucked in behind the Safeway Supermarket - it's a jealously guarded secret full of genuinely yummy sustainable and healing foods delights as well as a serious array of speciality teas and coffees. Keep an eye out for their occasional breakfast degustation menus and other celebratory meals. 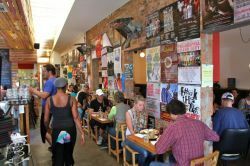 So book yourself in, and head down to Carlisle Street when the munchies next come to bite! Why? Because Carlisle Street is serious about cafes!